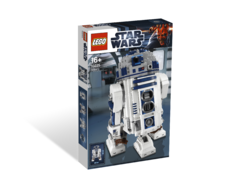 10225 R2-D2 is a UCS Star Wars set released in May 2012. It has a retractable third leg that can be dropped with a rear switch and rotating dome head. The front panels open to reveal a buzz saw and computer linkage tool. This model also includes a fact plaque to display along with an R2-D2 minifigure. More outer detail on this set includes black photoreceptors, a red sensor, and an accurate blue, gray, and white colour scheme. The hologram recorder/transmitter and charger are also visible. This set is over 12 inches (31 cm) high and 7 inches (18 cm) wide. It contains 2127 pieces, making it the 19th largest LEGO set in history. This is the third full minifigure to be made into an Ultimate Collector's Series set. The first was the 2002 Yoda. There was also a 2008 General Grievous. A bust of the sith apprentice Darth Maul was also made in 2001. R2-D2 has also been made as a 2002 TECHNIC set and a 1999 mindstorms set. This will be the seventh LEGO R2-D2 as a minifigure or a set to be made in LEGO. This is a description taken from LEGO.com. Please do not modify it. 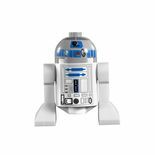 (visit this item's product page) Presenting the ultimate collector series R2-D2 – the best-loved droid in the Star Wars galaxy! Presenting the iconic R2-D2 as you've never seen him before. Everyone's favorite droid from the Star Wars galaxy is now part of the ultimate collector series and features fantastic detailing, such as rectractable third leg, front panels that open to reveal a universal computer interface arm and a circular saw, rotating head and 2 fold-out front spacecraft linkage control arms. With the included fact plaque and mini R2-D2 figure, this diminutive model is the perfect addition to your Star Wars collection! Measures over 12” (31cm) high and 7” (18cm) wide. Measures over 12” (31 cm) high and 7” (18 cm) wide! The first 48,480 orders of this set got an exclusive poster. There are many colorful bricks inside. To lower the third leg, you must push the lever down once, lean it forward, then push it down again to lock it into place. In the back of Book 3, the 2012 Summer sets and minifigures are shown. Presenting the ultimate collector series R2-D2 – the best-loved droid in the Star Wars galaxy! This page was last edited on 9 February 2019, at 15:25.